Recently I had the opportunity to try Melt. I had been wanting to try this Melt Butter Alternative for a while now, and have heard good things about it. I was surprised to realize that Melt tastes a lot like butter, actually I really could not tell it was anything different. It is a rich and creamy butter alternative made from coconut, canola, palm fruit, soybean, and flax seed oil blend. Melt is so incredibly creamy and delicious that it almost seems too good to be true. However, Melt is good for you. Yes…you read that right. Melt is healthy! We all want find healthier options that actually taste good, and this is fabulous. 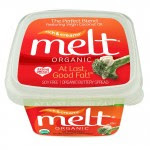 The company specifically designed Melt to be a healthy organic gluten free butter alternative. Cooking with Melt was a blast and I got the same results I would with normal butter products. When spread onto bread you get the same creamy effect you get with other butters. When sautéing with Melt I did notice yo that I didn’t need as much product as I would with real butter, and it has a milder taste. I have not tried baking with it because Melt is a bit on the expensive side. I got 2 tubs of Melt for $5 at Fred Meyers but it was on sale. Normal price for it is around $3.99 for a small tub, so baking cookies with this might not be in my future. Please visit Melt’s website for more information and find a location to purchase. Like this review? Leave a comment telling me so!